his straw for the nest. while today grows sky high. Then they mow his field. Set fire to his forest. and time unwinds tomorrow’s ties. walks, jogs through the blister. but my voice is tinder. but my limbs would catch fire. Maybe his tears will save him. Paul Sherman is a recluse living in the mountains of western North Carolina. He reads his poetry to the forest that creeps close to his house. He carries binoculars to view the warblers that sometimes appear in the trees to listen. His work has yet to be found. 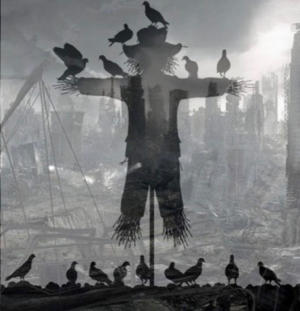 Editor’s Note: A scarecrow (pngtree)is combined with an apocalyptic scene from a French site: L’apocalypse. La fin du monde.